In case you missed it last month, we wanted to remind you that the Department of City Development (DCD) has created a new tool as a single resource for those looking for housing information and resources from various City departments. The Housing Help web tool filters information for three types of users: homeowners, home buyers and investors/non-profit organizations. Explore this new tool to find resources you can use! Whether you’re in the market for a fixer-upper, a historic house, a vacant lot to build on, or are looking for resources to improve your existing home, we can help you reach your goals. Continue reading below about properties for sale, learning opportunities and events, neighborhood news and more. And be sure to visit our resource table at the Bronzevillle Cultural and Arts Festival on August 5! Houses for sale on the Extended Listing are available to owner-occupants and investors who want to earn rental income. Houses are also listed with external agents. Work with your realtor to find your new home in the city. Be sure to visit our website on Friday, August 11 to view a new listing of properties posted to the Current Listing! This property will be listed for sale on the Current Listing on August 11, 2017. A classic and sturdy duplex in the heart of Historic Concordia Neighborhood. The Bingenheimer house sits on a roomy lot on one of Concordia’s finest stretches of historic homes. This Queen Anne gem was built in 1906 from a design by Architect Charles Keller. Exterior was completely renovated in 2017 and awaits a buyer to modernize the interior. Room for a side drive on south of house. 4 BR / 2 BA • 1,173 sq. ft. This 2-story, side gabled, side entry cottage was built in 1923 and is located in the Garden Homes Neighborhood, which is listed on the National Register of Historic Places. The lot is 3,700 sq. ft. and includes a side drive with detached garage. May be eligible for $20,000 forgivable loan, WI Historic Homeowner’s Tax Credits and Transform Advantage mortgage pilot program. Do you own property built before 1950 in the 53204, 53205, 53206, 53208, 53209, 53210, 53212, 53215 or 53216 zip codes? And have children under 4 years old? 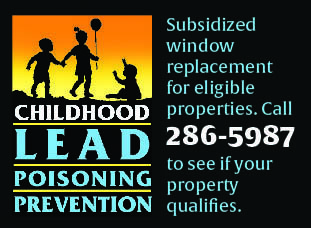 If so, your property may be eligible for subsidized window replacement. View flyer for eligibility and location requirements, or call (414) 286-5987. An additional $5,000/unit is available to address environmental asthma triggers if anyone 2-40 years old has asthma. You are invited to participate in a public meeting regarding a proposed amendment to the Near West Side Area Comprehensive Plan. Building off recent studies and activity, DCD planning staff will work with the Near West Side Partners and the public to amend the now 12 year old Near West Side plan and create a vision and action plan for the revitalization of North 27th Street between West Highland and West St. Paul Avenues that will reflect current market conditions, opportunities, and neighborhood priorities. WHEN: Wednesday, July 26 from 4:30 - 6:30 p.m. Open house format so come when you can. Short presentation at 5 p.m.
WHERE: The UWM Mobile Design Box at 753 N. 27th Street (near intersection of N. 27th & Wells). Drinks and snacks provided. Please join us for an upcoming free Power Hour information session to find out how you can install solar with the group buy program and be a part of Milwaukee's clean energy revolution! More sessions online. Colectivo Prospect, 2211 N. Prospect Ave.
Culture, history, art, commerce, community and culture rooted in a rich urban tradition will be celebrated August 5-12, 2017 when the 5th annual Bronzeville Week is held in Milwaukee, hosted by Alderwoman Milele A. Coggs and the City of Milwaukee. Bronzeville Cultural & Arts Festival, August 5, 10 a.m.-6 p.m.
Visit our City of Milwaukee DCD table at the festival on August 5 for resources on housing and programs! NIDC offers Community Improvement Project (CIP) grants to support community projects that engage community members and physically improve neighborhoods in Milwaukee. The maximum CIP grant request available for a project is $4,000. Attending an info session is required. Martin Luther King Jr. Library, 310 W. Locust St.
Wednesday, August 9, 9 a.m. - 3 p.m. Sign-In: 8:30 a.m.
Tuesday & Wednesday, August 22-23, 4:30 - 7 p.m. Sign-In: 4:00 p.m.
Wednesday, August 15, 6-7:30 p.m.
Financial resources and incentives may be available from the City such as façade grants, white box grants and retail investment funds. Business financing may also be available through our partner MEDC. View more commercial properties for sale at milwaukee.gov/CRE. This Spanish Colonial style theater was built as the independent, 840-seat Ritz cinema in 1926. The 7,200 SF brick building was also previously used as a theater, school and office space. Restoration of the building and façade are required. Permitted uses include theater, restaurant, retail, office, business/food service, bank, etc. Stone Creek Coffee, Salon Nova, other new businesses reviving Milwaukee's Downer Ave.